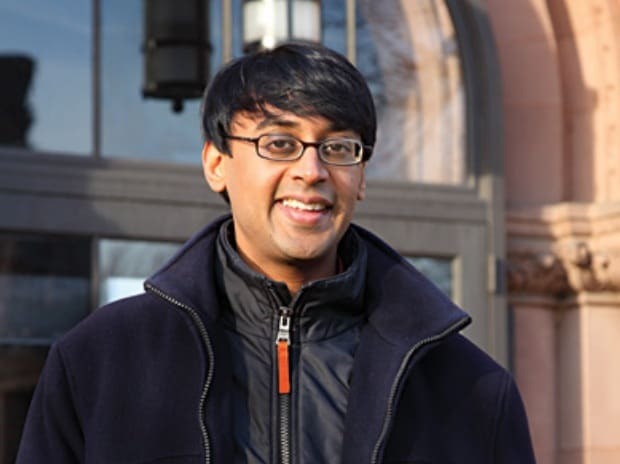 Manjul Bhargava is an Indian origin American Mathematician who set a record of becoming the first person of this genre to win the Fields Medal, popularly known as the Nobel Prize of Mathematics. This award is distributed out every four years by the International Mathematical Union (IMU) to mathematicians who are not over 40 for their existing work as well as "promise of future achievement". He is best popular for his works and contributions in the area of Number Theory especially the Gauss composition law. He proved his sign of prodigy very early when he was pursuing his bachelor degree somewhere in 1996 when awarded the prestigious Morgan Prize. He is also very famous for his popular class designed for first-year students, "The Mathematics of Magic Tricks and Games," in which students explore the mathematical principles behind games and magic tricks. Apart from his mathematical abilities, he is also a very accomplished tabla player. Ustad Zakir Hussain has personally trained him on this. He is residing in the USA currently but travels to India often and collaborates with the Tata Institute of Fundamental Research as well as the Indian Institutes of Technology on pedagogical issues. He is a huge admirer of Sanskrit poetry as he also taken Sanskrit education from his grandfather Purushottam Lal Bhargava who is a well known Sanskrit and ancient Indian history scholar. Manjul was born on 8 August 1974 in Hamilton ( Ontario, Canada, USA ) and brought up primarily in Long Island, New York. His father was an immigrant from India. His mother was a mathematician at Hofstra University. He got his mathematical abilities from his mother as she was his first teacher of same. He was very sharp minded since childhood and completed his studies of high school mathematics along with computer science just at the age of 14. He did his schooling from Plainedge High School in North Massapequa. He was titled as Valedictorian ( title given in countries like USA, Canada, Costa Rica,the Philippines for highest ranking among his/her graduating class ) for his graduation degree which he completed in the year 1992. In 1996, he gained B.A degree from Harvard University and then came to achieving his Doctorate title in 2001 from Princeton. He used to be the visiting professor somewhere around 2001-03 at Institute for Advanced Study and Harvard University. In the year 2003, he was appointed as full-time Scholar by Princeton. In late 2010, he appointed to Stieltjes Chair at Leiden University. a ) 14 new Gauss-style composition laws. b ) Determined the asymptotic density of discriminants of quartic and quintic number fields. c ) Proved the first ever case of Cohen-Lenstra-Martinet heuristics for class groups. d ) Proof of the 15 theorem, including an extension of the theorem to another number, sets such as the odd numbers and the prime numbers. e ) Proof (with Jonathan Hanke) of the 290 theorem. f ) A novel generalisation of the factorial function, resolving a decades-old conjecture by George Pólya. g ) Proof (with Arul Shankar) that the average rank of all elliptic curves over Q (when ordered by height) is bounded. h ) Proof of Birch and Swinnerton-Dyer conjecture for a positive proportion of elliptic curves in joint collaboration with Arul Shankar in 2010.
a ) Prestigious Fields Medal, the highest award in the field of mathematics in the year 2014.
b ) After Charles Fefferman and Andrew Wiles, Manjul is the third youngest full professor in Princeton University's history. c ) In 1996, won Morgan Prize for a mathematical research during his under graduation. d ) In 2011, won Fermat Prize for "various generalisations of the Davenport-Heilbronn estimates and for his startling recent results (with Arul Shankar) on the average rank of elliptic curves". e ) Won $10,000 SASTRA Ramanujan Prize, shared with Kannan Soundararajan, awarded by SASTRA in 2005 at Tanjavur, India, for his outstanding contributions to number theory. f ) In 2008, awarded the American Mathematical Society's Cole Prize. h ) In 2013, elected to the National Academy of Sciences. i ) In 2014, awarded the Fields Medal at the International Congress of Mathematicians in Seoul for "developing powerful new methods in the geometry of numbers, which he applied to count rings of small rank and to bound the average rank of elliptic curves"
j ) In 2015, awarded the Padma Bhushan, the third highest civilian award of India. 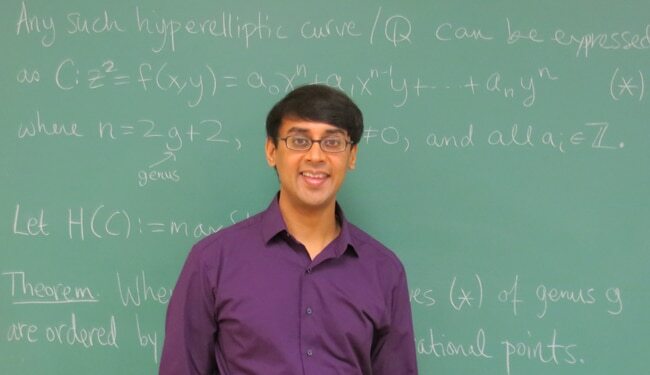 Right now, Manjul is the R. Brandon Fradd Professor of Mathematics at Princeton University, the Stieltjes Professor of Number Theory at Leiden University, and also holds Adjunct Professorships at the Tata Institute of Fundamental Research, the Indian Institute of Technology Bombay, and the University of Hyderabad. He is also associated with the GIAN ( Global Initiative of Academic network ) which is Narendra Modi's ( Prime Minister of India ) brainchild and he had discussed the initiative with US President Barack Obama during his visit to America in October 2014. It is a short-term teaching program under which scholars abroad will be invited to teach in India.